From the Star Wars Pop! Vinyl collection by Funko. 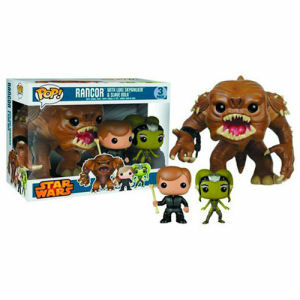 Star Wars Rancor Luke and Oola Pop! Vinyl Figure Bobble Head 3-Pack - Previews Exclusive. This Item is in stock and ready to ship. You should not postpone your purchase and miss out on adding Star Wars Rancor Luke and Oola Pop! Vinyl Figure Bobble Head 3-Pack - Previews Exclusive to your Star Wars Pop! Vinyl collection! From the Star Wars Pop! Vinyl collection by Funko. Star Wars Rancor Luke and Oola Pop! Vinyl Figure Bobble Head 3-Pack - Previews Exclusive. Luke and Oola measure 3.75 inches tall. The Rancor measure 6 inches tall.